The South Nyack, NY area has had 0 reports of on-the-ground hail by trained spotters, and has been under severe weather warnings 46 times during the past 12 months. 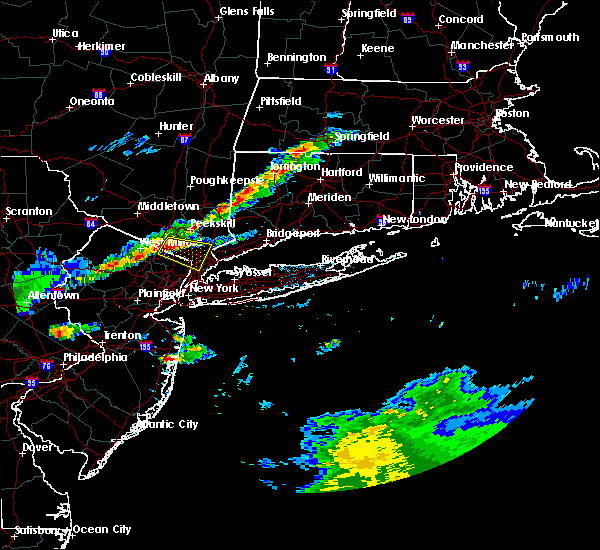 Doppler radar has detected hail at or near South Nyack, NY on 15 occasions, including 2 occasions during the past year. 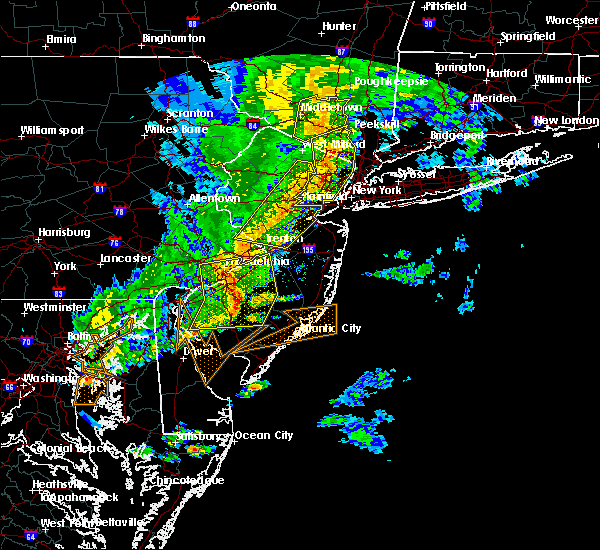 4/15/2019 4:37 AM EDT At 437 am edt, severe thunderstorms were located along a line extending from ossining to harlem to near keansburg, moving east at 50 mph (radar indicated). Hazards include 60 mph wind gusts. Expect damage to trees and power lines. 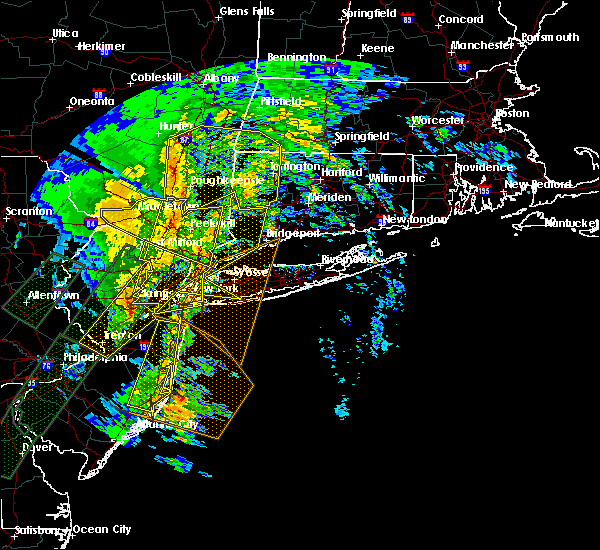 severe thunderstorms will be near, mott haven and ossining around 440 am edt. 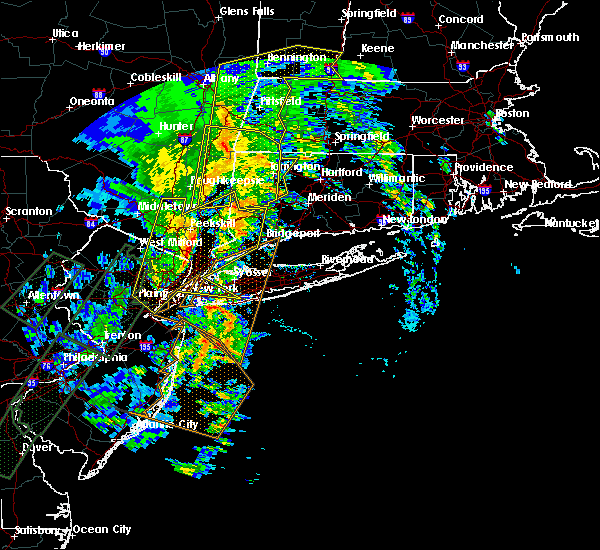 yonkers and flushing around 445 am edt. flatbush and new rochelle around 450 am edt. canarsie and howard beach around 455 am edt. 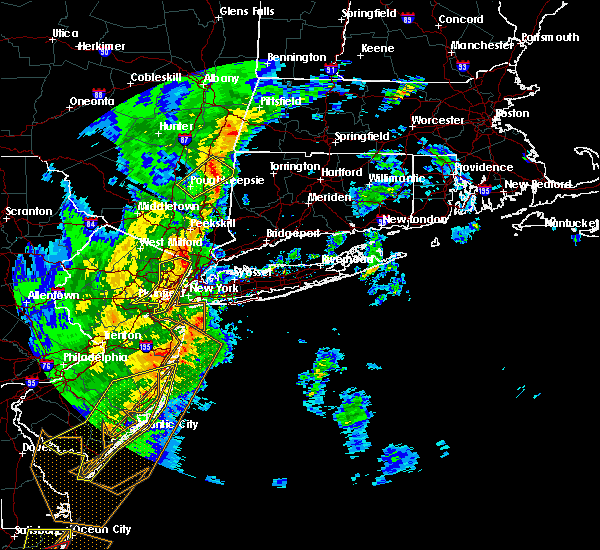 Stamford and valley stream around 500 am edt. 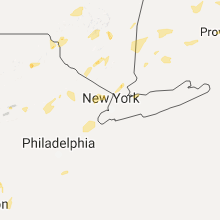 3/15/2019 8:41 PM EDT The severe thunderstorm warning for southern fairfield, eastern passaic, central bergen, central westchester and rockland counties will expire at 845 pm edt, the severe thunderstorm which prompted the warning has moved out of the warned area. therefore, the warning will be allowed to expire. 3/15/2019 8:08 PM EDT At 807 pm edt, a severe thunderstorm was located over hawthorne, or over paterson, moving northeast at 45 mph (radar indicated). Hazards include 60 mph wind gusts and penny size hail. Expect damage to trees and power lines. this severe thunderstorm will be near, ridgewood around 810 pm edt. paramus and oradell around 815 pm edt. pearl river and norwood around 820 pm edt. tappan and orangeburg around 825 pm edt. tarrytown and dobbs ferry around 830 pm edt. white plains and harrison around 835 pm edt. Stamford and mount kisco around 845 pm edt. 11/3/2018 1:01 AM EDT At 100 am edt, a severe thunderstorm was located over monsey, moving northeast at 50 mph (radar indicated). Hazards include 60 mph wind gusts. Expect damage to trees and power lines. this severe storm will be near, tappan and orangeburg around 105 am edt. new city and haverstraw around 110 am edt. Ossining and peekskill around 115 am edt. 11/3/2018 12:50 AM EDT At 1250 am edt, a severe thunderstorm was located near wayne, moving northeast at 45 mph (radar indicated). Hazards include 60 mph wind gusts. Expect damage to trees and power lines. this severe thunderstorm will be near, paramus and ridgewood around 1255 am edt. ramsey and suffern around 100 am edt. monsey and nanuet around 105 am edt. new city and nyack around 110 am edt. Ossining and haverstraw around 115 am edt. 8/17/2018 7:29 PM EDT At 729 pm edt, severe thunderstorms were located along a line extending from near yorktown heights to greenwich, moving northeast at 40 mph (radar indicated). Hazards include 60 mph wind gusts and quarter size hail. Minor hail damage to vehicles is possible. expect wind damage to trees and power lines. severe thunderstorms will be near, norwalk and new canaan around 745 pm edt. westport and wilton around 755 pm edt. ridgefield and weston around 800 pm edt. danbury and redding around 805 pm edt. Bethel around 810 pm edt. 8/17/2018 7:13 PM EDT At 712 pm edt, severe thunderstorms were located along a line extending from near mount kisco to scarsdale, moving northeast at 35 mph (radar indicated). Hazards include 60 mph wind gusts and quarter size hail. Minor hail damage to vehicles is possible. expect wind damage to trees and power lines. these severe storms will be near, mount kisco and bedford around 720 pm edt. Stamford and greenwich around 730 pm edt. 8/17/2018 7:03 PM EDT At 702 pm edt, severe thunderstorms were located along a line extending from upper nyack to near yonkers, moving northeast at 40 mph (radar indicated). Hazards include 60 mph wind gusts and quarter size hail. Minor hail damage to vehicles is possible. expect wind damage to trees and power lines. severe thunderstorms will be near, ossining and tarrytown around 705 pm edt. white plains around 710 pm edt. harrison and hawthorne around 715 pm edt. mount kisco around 720 pm edt. Stamford and greenwich around 730 pm edt. 8/17/2018 6:59 PM EDT At 659 pm edt, severe thunderstorms were located along a line extending from near pearl river to near norwood, moving northeast at 25 mph (radar indicated). Hazards include 60 mph wind gusts and quarter size hail. Minor hail damage to vehicles is possible. expect wind damage to trees and power lines. Locations impacted include, hackensack, bergenfield, paramus, nanuet, dobbs ferry, nyack, tappan, englewood, pearl river, oradell, norwood, orangeburg, teterboro, teaneck and spring valley. 8/17/2018 6:36 PM EDT At 636 pm edt, severe thunderstorms were located along a line extending from hawthorne to teterboro, moving northeast at 25 mph (radar indicated). Hazards include 60 mph wind gusts and quarter size hail. Minor hail damage to vehicles is possible. expect wind damage to trees and power lines. severe thunderstorms will be near, hackensack around 640 pm edt. paramus and ridgewood around 645 pm edt. bergenfield and oradell around 650 pm edt. norwood around 700 pm edt. monsey and nanuet around 705 pm edt. dobbs ferry and orangeburg around 710 pm edt. Nyack around 715 pm edt. 7/3/2018 2:36 PM EDT At 235 pm edt, a severe thunderstorm was located over tappan, moving northeast at 10 mph (radar indicated). Hazards include 60 mph wind gusts. Expect damage to trees and power lines. this severe storm will be near, tappan around 240 pm edt. pearl river around 245 pm edt. nanuet and dobbs ferry around 255 pm edt. Nyack around 300 pm edt. 7/3/2018 2:18 PM EDT At 218 pm edt, a severe thunderstorm was located near norwood, or near tappan, moving northeast at 10 mph (radar indicated). Hazards include 60 mph wind gusts. Expect damage to trees and power lines. this severe thunderstorm will be near, norwood around 225 pm edt. tappan around 240 pm edt. pearl river around 245 pm edt. orangeburg around 250 pm edt. nanuet and dobbs ferry around 255 pm edt. Nyack around 300 pm edt. 5/15/2018 4:38 PM EDT At 437 pm edt, severe thunderstorms were located along a line extending from lake carmel to near west point to victory gardens to washington to near coffeetown, moving east at 45 mph. these are very dangerous storms (the new york state mesonet site at beacon reported winds of 78 mph at 420 pm). Hazards include 80 mph wind gusts and penny size hail. Flying debris will be dangerous to those caught without shelter. mobile homes will be heavily damaged. expect considerable damage to roofs, windows, and vehicles. extensive tree damage and power outages are likely. Locations impacted include, yonkers, paterson, stamford, waterbury, danbury, passaic, white plains, wayne, bloomfield, hackensack, shelton, new city, naugatuck, orange and newburgh. 5/15/2018 4:06 PM EDT At 405 pm edt, severe thunderstorms were located along a line extending from near wallkill to near high point to near dingmans ferry to stormville to near tamaqua, moving east at 110 mph (radar indicated). Hazards include 70 mph wind gusts and quarter size hail. Minor hail damage to vehicles is possible. expect considerable tree damage. wind damage is also likely to mobile homes, roofs, and outbuildings. Locations that could be impacted include, yonkers, paterson, stamford, waterbury, danbury, passaic, white plains, wayne, bloomfield, hackensack, shelton, new city, naugatuck, orange and newburgh. 5/15/2018 3:34 PM EDT At 331 pm edt, severe thunderstorms were located along a line extending from hazel to near lava to new boston-morea, moving east at 70 mph (radar indicated). Hazards include 70 mph wind gusts and quarter size hail. Minor hail damage to vehicles is possible. expect considerable tree damage. wind damage is also likely to mobile homes, roofs, and outbuildings. severe thunderstorms will be near, howells around 350 pm edt. montgomery around 400 pm edt. walden around 405 pm edt. newburgh and new windsor around 410 pm edt. fahnestock state park around 420 pm edt. lake carmel around 425 pm edt. brookfield and new fairfield around 435 pm edt. danbury and newtown around 440 pm edt. summit and southbury around 450 pm edt. waterbury and naugatuck around 455 pm edt. Bloomfield and rutherford around 500 pm edt. 5/3/2018 6:45 PM EDT At 644 pm edt, showers and thunderstorms capable of producing damaging winds were located along a line extending from near yorktown heights to near upper nyack to near nanuet, moving east at 50 mph (radar indicated). Hazards include 60 mph wind gusts. Expect damage to trees and power lines. 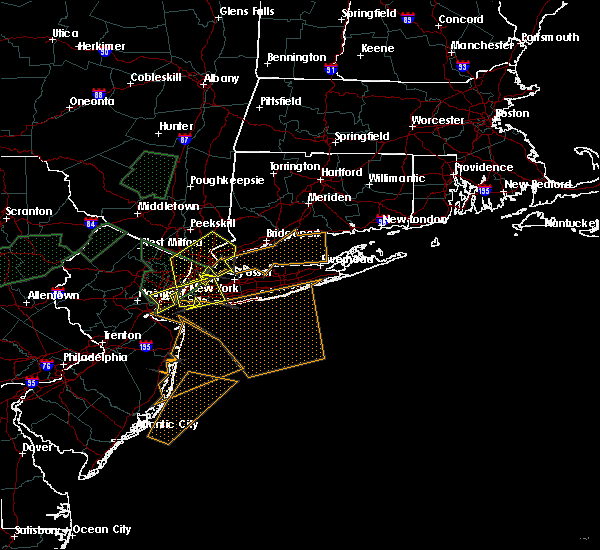 severe thunderstorms will be near, tarrytown and mount kisco around 650 pm edt. dobbs ferry and hawthorne around 655 pm edt. 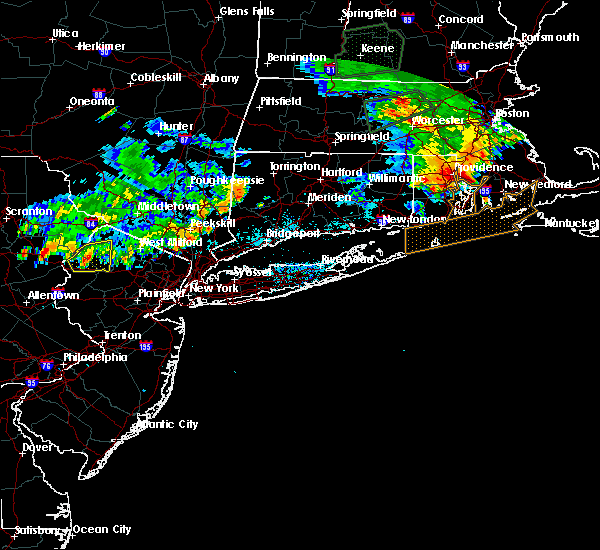 yonkers and stamford around 700 pm edt. new rochelle and white plains around 705 pm edt. norwalk and port chester around 710 pm edt. Westport around 715 pm edt. 6/19/2017 5:36 PM EDT The severe thunderstorm warning for hudson, eastern passaic, union, bergen, essex, southern westchester, richmond, bronx, new york and rockland counties will expire at 545 pm edt, the storms which prompted the warning have moved out of the warned area. therefore, the warning will be allowed to expire. 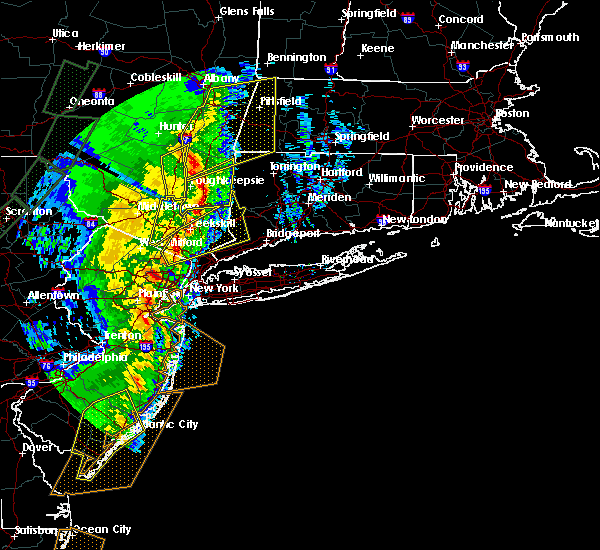 a severe thunderstorm watch remains in effect until 800 pm edt for northeastern new jersey, and southeastern new york. 6/19/2017 5:01 PM EDT At 500 pm edt, severe thunderstorms were located along a line extending from millstone to bound brook to society hill to near edison to near new brunswick, moving northeast at 45 mph (radar indicated). Hazards include 60 mph wind gusts. Expect damage to roofs, siding, and trees. severe thunderstorms will be near, plainfield around 505 pm edt. clark around 510 pm edt. elizabeth and linden around 515 pm edt. newark and jersey city around 520 pm edt. passaic and hoboken around 525 pm edt. paterson and hackensack around 530 pm edt. wayne and bergenfield around 535 pm edt. yonkers and tappan around 540 pm edt. White plains and new city around 545 pm edt. 6/19/2017 4:35 PM EDT At 435 pm edt, a severe thunderstorm was located over newark, moving northeast at 45 mph (radar indicated). Hazards include 60 mph wind gusts and penny size hail. Expect damage to roofs, siding, and trees. this severe thunderstorm will be near, jersey city around 440 pm edt. 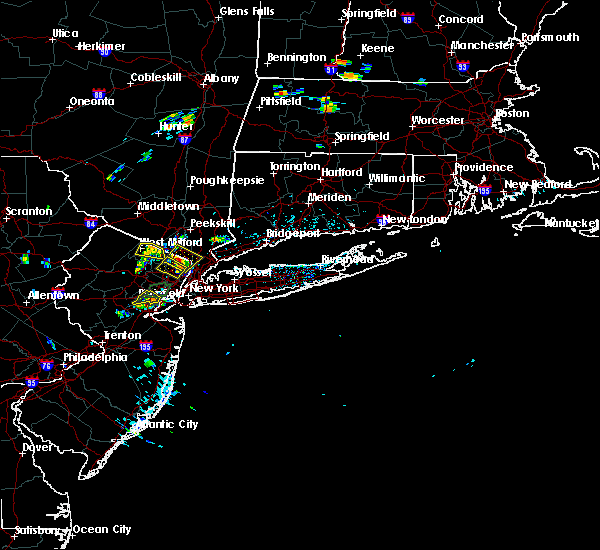 hoboken and lyndhurst around 445 pm edt. hackensack and ridgefield around 450 pm edt. flushing and mott haven around 455 pm edt. east tremont and throgs neck bridge around 500 pm edt. yonkers and co-op city around 505 pm edt. new rochelle and dobbs ferry around 510 pm edt. white plains and glen cove around 515 pm edt. Bayville around 520 pm edt. 2/25/2017 6:29 PM EST At 629 pm est, severe thunderstorms were located along a line extending from near pawling to near yorktown heights to near pearl river, moving northeast at 65 mph (radar indicated). Hazards include 60 mph wind gusts. Expect damage to roofs, siding, and trees. these severe storms will be near, mahopac and sherman around 640 pm est. lake carmel around 645 pm est. danbury and bethel around 650 pm est. brookfield around 655 pm est. Brewster and ridgefield around 700 pm est. 2/25/2017 6:10 PM EST At 609 pm est, severe thunderstorms were located along a line extending from near fahnestock state park to near suffern to near ridgewood, moving northeast at 45 mph (radar indicated). Hazards include 60 mph wind gusts and penny size hail. Expect damage to roofs, siding, and trees. severe thunderstorms will be near, cold spring and fahnestock state park around 615 pm est. tarrytown and lake carmel around 625 pm est. 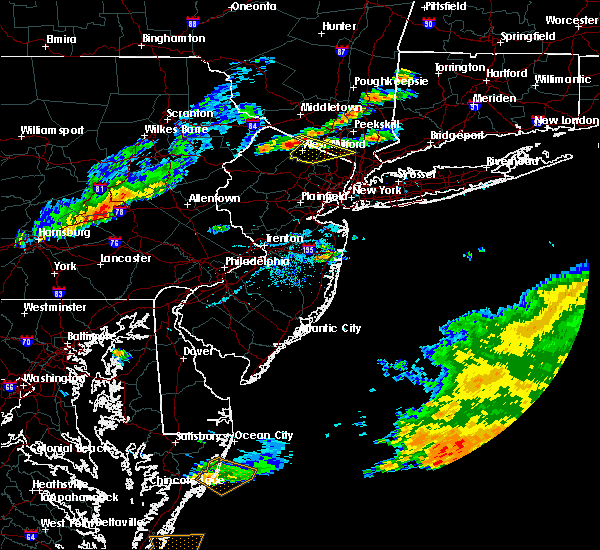 ossining and peekskill around 630 pm est. new fairfield and yorktown heights around 635 pm est. mount kisco and greenwich around 640 pm est. mahopac and sherman around 645 pm est. stamford and brewster around 650 pm est. new canaan around 655 pm est. Danbury and ridgefield around 700 pm est. 8/13/2016 11:49 PM EDT At 1148 pm edt, a severe thunderstorm was located over new city, moving east at 25 mph (radar indicated). Hazards include 60 mph wind gusts. Expect damage to roofs. siding. and trees. this severe thunderstorm will be near, haverstraw and nyack around 1155 pm edt. north tarrytown and upper nyack around 1200 am edt. ossining and peekskill around 1205 am edt. hawthorne around 1210 am edt. 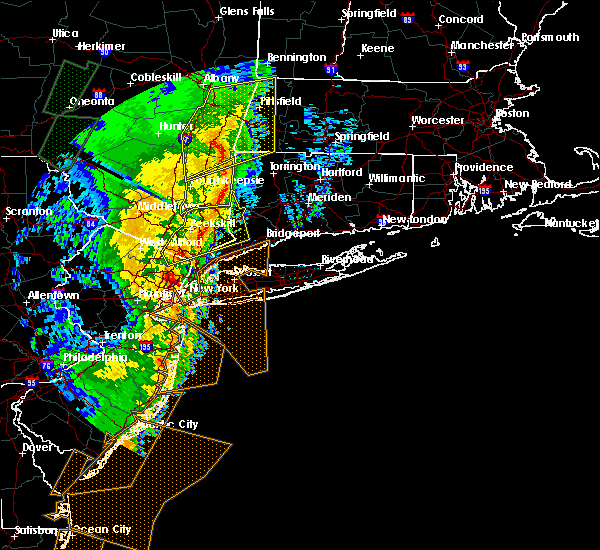 mount kisco and yorktown heights around 1220 am edt. stamford, greenwich and bedford around 1230 am edt. Other locations impacted by this severe thunderstorm include west haverstraw, pleasantville, west nyack, blauvelt, valley cottage, spring valley, thornwood, armonk, thiells and chestnut ridge. 7/25/2016 6:32 PM EDT At 631 pm edt, severe thunderstorms were located along a line extending from near peekskill to new city to hawthorne, moving east at 40 mph (radar indicated). Hazards include 60 mph wind gusts. Expect damage to roofs. siding. and trees. 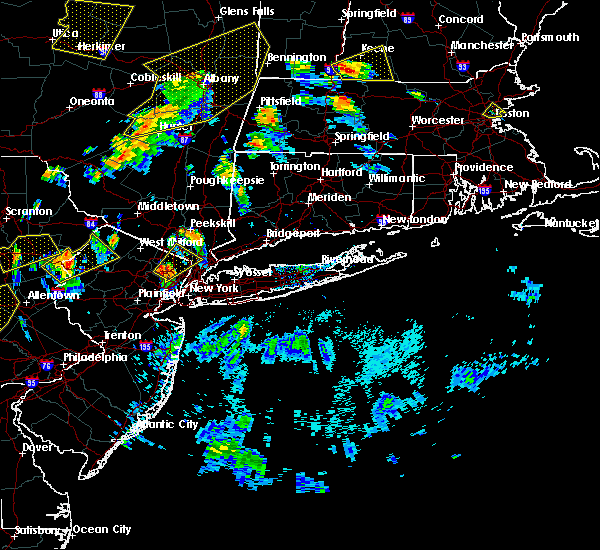 severe thunderstorms will be near, peekskill, haverstraw, nyack, upper nyack and orangeburg around 635 pm edt. englewood and hawthorne around 645 pm edt. yonkers, dobbs ferry and bedford around 655 pm edt. stamford, white plains, new canaan, harrison and ridgefield around 705 pm edt. Port chester, rye, darien, wilton and georgetown around 710 pm edt. 7/1/2016 5:12 PM EDT At 512 pm edt, severe thunderstorms were located along a line extending from near wappingers falls to near upper greenwood lake, moving east at 35 mph (radar indicated). Hazards include 60 mph wind gusts. Expect damage to roofs. siding. and trees. severe thunderstorms will be near, newburgh and gardnertown around 515 pm edt. ramsey and suffern around 530 pm edt. monsey and new york--newark around 535 pm edt. nanuet, pomona and pearl river around 540 pm edt. new city around 545 pm edt. peekskill, haverstraw, nyack, new fairfield and upper nyack around 550 pm edt. ossining, tarrytown, sherman and north tarrytown around 555 pm edt. mount kisco, brookfield, hawthorne and yorktown heights around 600 pm edt. other locations impacted by these severe thunderstorms include west haverstraw, pleasantville, upper saddle river, west nyack, balmville, highland mills, spring valley, montvale, brewster hill and thiells. A tornado watch remains in effect until 1000 pm edt for southern connecticut, northeastern new jersey, and southeastern new york. 7/1/2016 4:15 PM EDT At 414 pm edt, severe thunderstorms were located along a line extending from ramsey to bergenfield, moving northeast at 30 mph (radar indicated). Hazards include 60 mph wind gusts. Expect damage to roofs. siding. and trees. severe thunderstorms will be near, norwood around 420 pm edt. 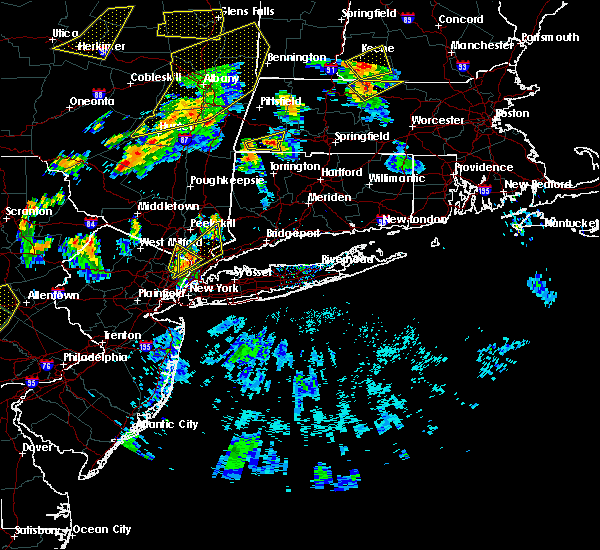 yonkers, monsey, tappan and pearl river around 425 pm edt. dobbs ferry, nanuet and orangeburg around 430 pm edt. 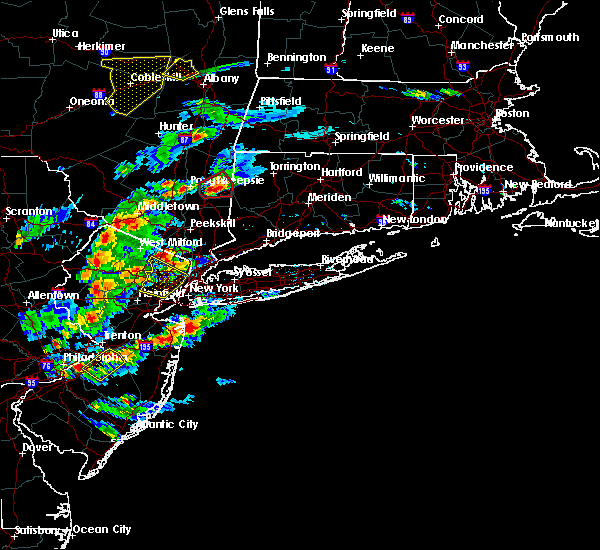 tarrytown, nyack, new city, north tarrytown, scarsdale, pomona and upper nyack around 435 pm edt. white plains, haverstraw and harrison around 440 pm edt. ossining and hawthorne around 445 pm edt. peekskill around 450 pm edt. mount kisco around 455 pm edt. other locations impacted by these severe thunderstorms include west haverstraw, rockleigh, pleasantville, upper saddle river, west nyack, haworth, wyckoff, spring valley, montvale and bogota. 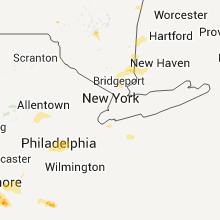 A tornado watch remains in effect until 1000 pm edt for southern connecticut, northeastern new jersey, and southeastern new york. 6/5/2016 6:40 PM EDT The severe thunderstorm warning for essex, union, eastern passaic, hudson, east central bergen, rockland and southeastern orange counties will expire at 645 pm edt, the storms which prompted the warning are moving out of the warned area. therefore, the warning will be allowed to expire. 6/5/2016 6:27 PM EDT At 626 pm edt, severe thunderstorms were located along a line extending from haverstraw to hackensack to colonia, moving east at 45 mph (radar indicated). Hazards include 60 mph wind gusts. Expect damage to roofs. siding. and trees. severe thunderstorms will be near, new york, ossining, tarrytown, north tarrytown, midtown manhattan, morningside heights and upper west side around 630 pm edt. mott haven, rfk bridge, riverdale, harlem, hawthorne, central park, astoria and long island city around 635 pm edt. 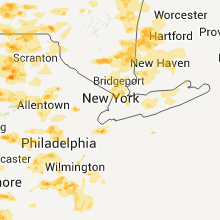 yonkers, mount kisco, east tremont, todt hill, laguardia airport, flushing, bronxville, cardinal spellman hs, co-op city and port richmond around 640 pm edt. new rochelle, bayonne, verrazano- narrows bridge, throgs neck bridge, city island, oakwood, tompkinsville and whitestone around 645 pm edt. coney island, bedford, arturo toscanini ps, bay ridge, bensonhurst and park slope around 650 pm edt. flatbush, crown heights and sheepshead bay around 655 pm edt. canarsie around 700 pm edt. 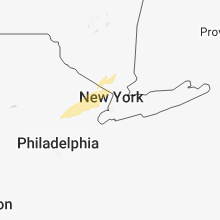 Other locations impacted by these severe thunderstorms include pleasantville, hastings-on-hudson, tuckahoe, rye brook, mount vernon, thornwood, washington heights, elmsford, armonk and greenwich village. 6/5/2016 6:15 PM EDT At 614 pm edt, severe thunderstorms were located along a line extending from near pomona to near paterson to middlesex, moving east at 45 mph (radar indicated). Hazards include 60 mph wind gusts. Expect damage to roofs. siding. and trees. these severe storms will be near, paterson, passaic, bloomfield, ridgewood, lyndhurst, rutherford, suffern, monsey, nanuet and hawthorne around 620 pm edt. 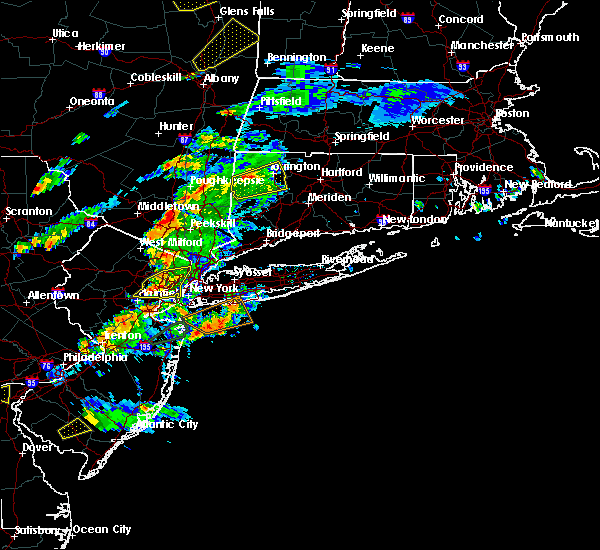 hackensack, paramus, secaucus, haverstraw, new city, oradell and teterboro around 625 pm edt. 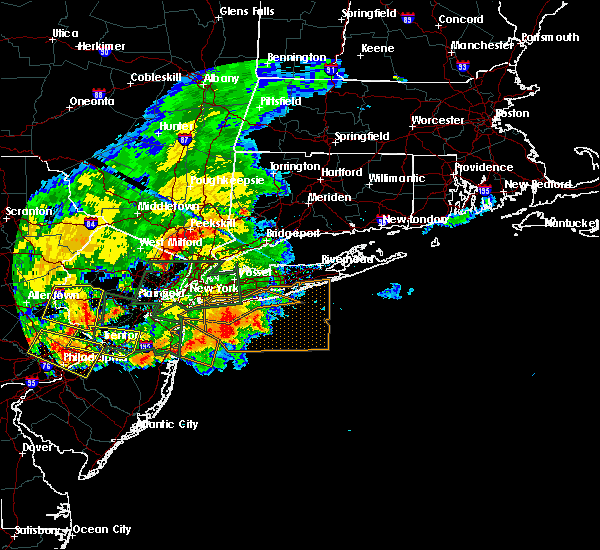 bergenfield, ridgefield, nyack, fort lee, englewood, union and upper nyack around 630 pm edt. elizabeth and linden around 635 pm edt. bayonne around 640 pm edt. Other locations impacted by these severe thunderstorms include west haverstraw, upper saddle river, wyckoff, springfield, montclair, spring valley, hillside, clifton, montvale and bogota. 6/5/2016 5:47 PM EDT At 545 pm edt, severe thunderstorms were located along a line extending from near franklin to near califon, moving east at 45 mph (radar indicated). Hazards include 60 mph wind gusts. Expect damage to roofs. siding. and trees. severe thunderstorms will be near, west milford and upper greenwood lake around 555 pm edt. bloomingdale and poughkeepsie-- newburgh around 600 pm edt. ringwood and pompton lakes around 605 pm edt. plainfield and sloatsburg around 610 pm edt. ridgewood, summit, millburn, ramsey and suffern around 615 pm edt. monsey, clark, union, pomona and colonia around 620 pm edt. elizabeth, linden, haverstraw, nanuet, new city, orange and pearl river around 625 pm edt. 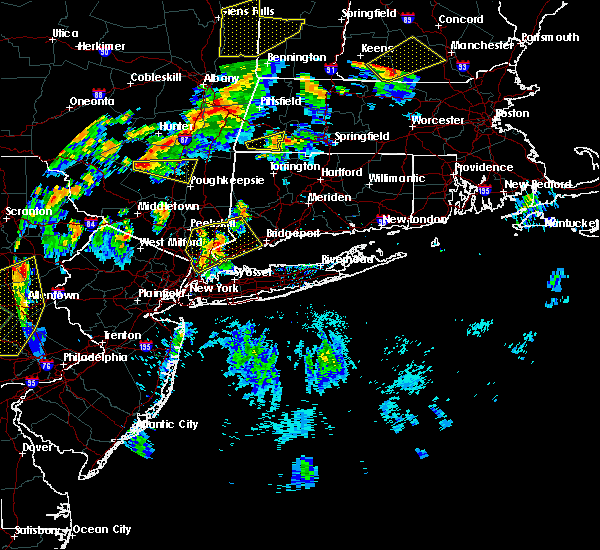 newark, harrison, nyack, tappan, kearny, norwood, upper nyack and orangeburg around 630 pm edt. Other locations impacted by these severe thunderstorms include west haverstraw, upper saddle river, wyckoff, springfield, montclair, spring valley, hillside, clifton, montvale and bogota. 2/25/2016 12:27 AM EST The severe thunderstorm warning for western new haven, fairfield, union, essex, hudson, eastern passaic, bergen, eastern orange, kings, queens, richmond, rockland, westchester, new york, bronx, central nassau and putnam counties will expire at 1230 am est, the storms which prompted the warning have moved out of the warned area. therefore the warning will be allowed to expire. 2/25/2016 12:00 AM EST At 1159 pm est, doppler radar indicated a line of severe thunderstorms capable of producing damaging winds in excess of 60 mph. these storms were located along a line extending from near myers corner to near new city to lyndhurst, moving northeast at 50 mph. 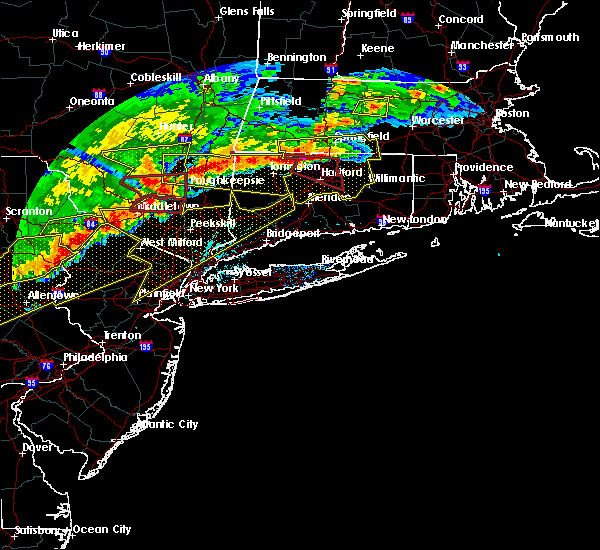 these severe storms will be near, peekskill around 1205 am est. ridgewood, yorktown heights and riverdale around 1210 am est. yonkers, dobbs ferry, tappan, mahopac, bronxville, norwood and pearl river around 1215 am est. white plains, tarrytown, nyack, brewster, north tarrytown, lake carmel, nanuet, carmel, upper nyack and orangeburg around 1220 am est. new york--newark and hawthorne around 1225 am est. mount kisco, pawling and new fairfield around 1230 am est. other locations impacted by these severe thunderstorms include west hempstead, thomaston, west haverstraw, pleasantville, springfield, mount vernon, montclair, spring valley, hillside and washington heights. 2/24/2016 11:26 PM EST At 1122 pm est, doppler radar indicated a line of severe thunderstorms capable of producing damaging winds in excess of 60 mph. 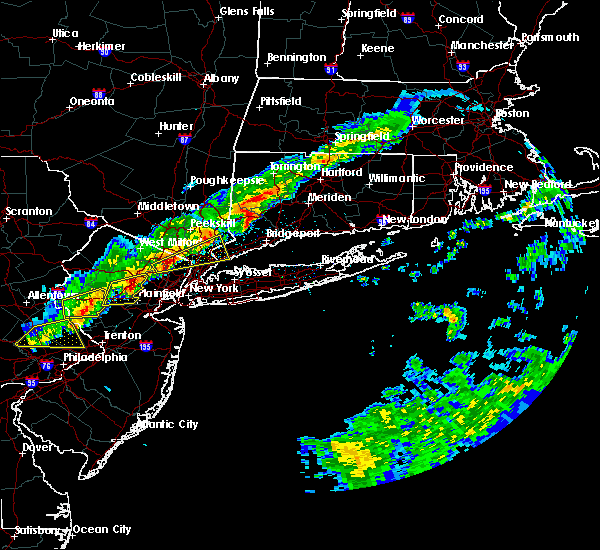 this line extending across the lower hudson valley of new york through portions of new york city and portions of northeast new jersey. it was moving northeast at 40 mph. 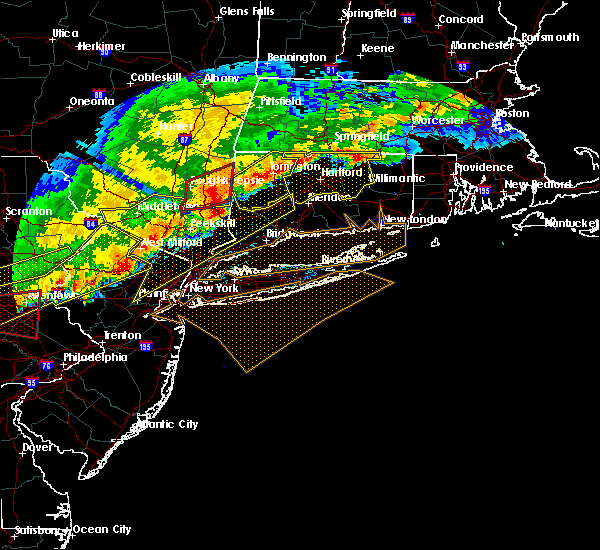 * severe thunderstorms will be near, bergenfield, and riverdale around 1130 pm est. yonkers, tappan, norwood and orangeburg around 1135 pm est. new rochelle, tarrytown, dobbs ferry, nyack, bronxville and upper nyack around 1140 pm est. north tarrytown and scarsdale around 1145 pm est. 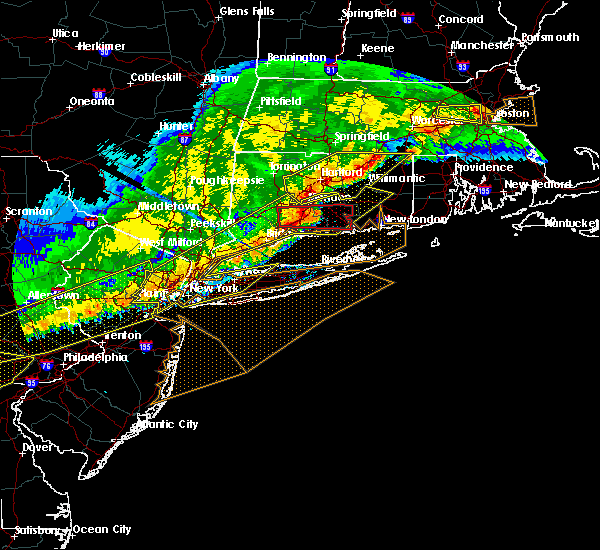 white plains, perth amboy, harrison, hawthorne and colonia around 1150 pm est. port chester around 1155 pm est. 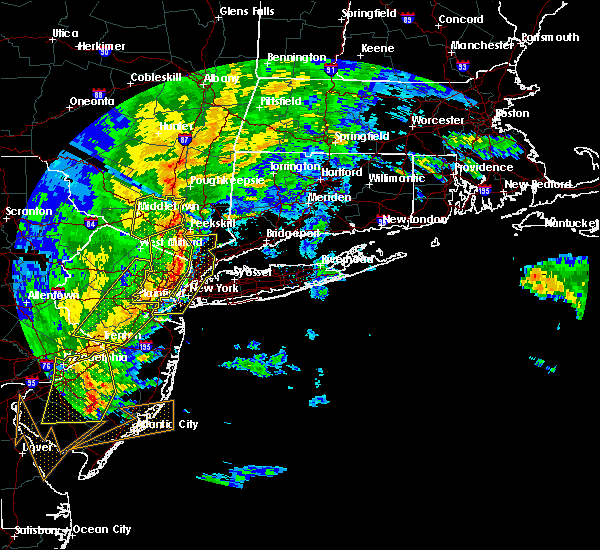 linden, greenwich and carteret around 1200 am est. bedford and port richmond around 1205 am est. other locations impacted by these severe thunderstorms include west hempstead, thomaston, west haverstraw, pleasantville, springfield, mount vernon, montclair, spring valley, hillside and washington heights. 2/24/2016 11:00 PM EST At 1058 pm est, doppler radar indicated a severe thunderstorms moving across the warning area capable of producing damaging winds in excess of 60 mph. these storms were moving northeast at 0 to 50 mph. locations impacted include, white plains, newburgh, middletown, ossining, peekskill, haverstraw, tarrytown, mount kisco, dobbs ferry, port jervis, monroe, walden, nyack, warwick, goshen, sloatsburg, cold spring, nanuet, new city and north tarrytown. 2/24/2016 10:35 PM EST At 1032 pm est, doppler radar indicated an area of thunderstorms capable of producing damaging winds in excess of 60 mph. 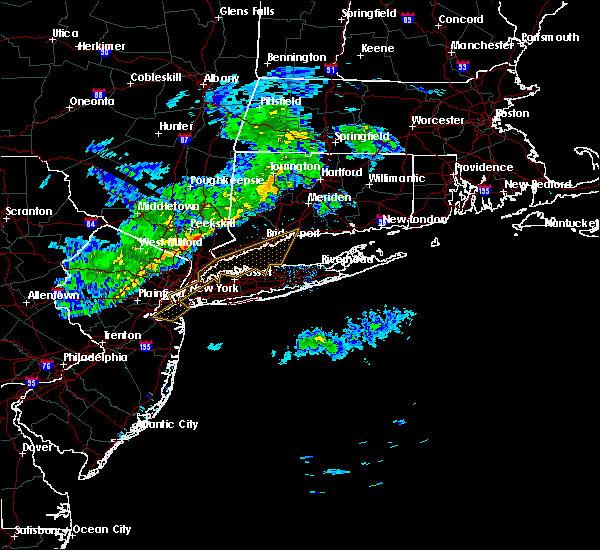 this activity will move across much of the lower hudson valley of new york. other locations impacted by this severe thunderstorm include west haverstraw, pleasantville, west nyack, balmville, highland mills, spring valley, thiells, irvington, grand view-on-huds and new hempstead. 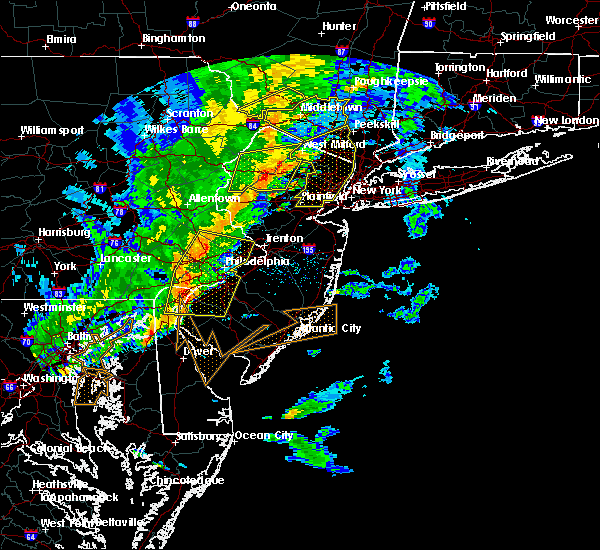 expect strong winds and heavy downpours with this activity. 7/21/2015 6:37 PM EDT At 636 pm edt, doppler radar indicated a severe thunderstorm capable of producing quarter size hail and damaging winds in excess of 60 mph. this storm was located over monsey, and moving east at 20 mph. 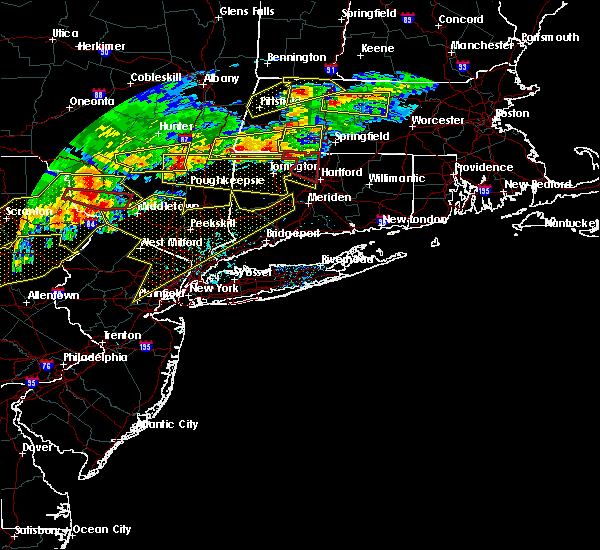 * this severe thunderstorm will be near, monsey around 640 pm edt. haverstraw, nanuet and new city around 650 pm edt. pearl river around 655 pm edt. ossining, tarrytown, dobbs ferry, nyack, north tarrytown, tappan, norwood, upper nyack, orangeburg and hawthorne around 700 pm edt. other locations impacted by this severe thunderstorm include airmont, west haverstraw, rockleigh, pleasantville, upper saddle river, west nyack, blauvelt, hastings-on-hudson, valley cottage and tuckahoe. 7/21/2015 6:27 PM EDT The severe thunderstorm warning for passaic. northwestern bergen. rockland and south central orange counties will expire at 630 pm edt. the storms which prompted the warning have weakened below severe limits. and no longer poses an immediate threat to life or property. Therefore the warning will be allowed to expire. 7/21/2015 6:00 PM EDT At 600 pm edt, doppler radar indicated a line of severe thunderstorms capable of producing quarter size hail and damaging winds in excess of 60 mph. these storms were located along a line extending from near upper greenwood lake to hamburg, and moving southeast at 20 mph. 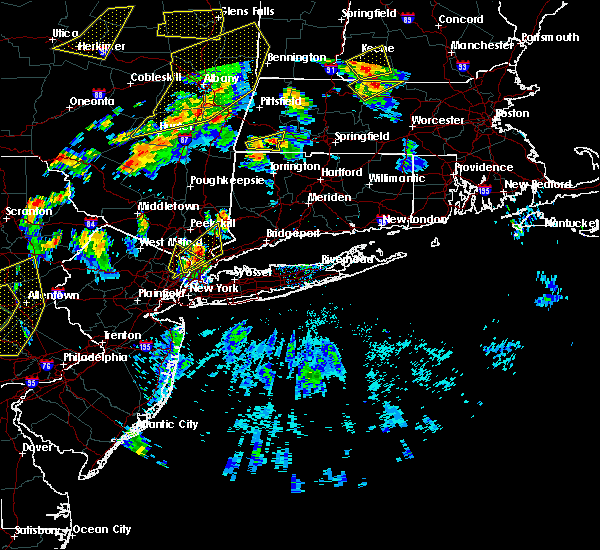 * severe thunderstorms will be near, warwick and upper greenwood lake around 605 pm edt. greenwood lake around 615 pm edt. ringwood around 625 pm edt. west milford, ramsey, suffern, sloatsburg, bloomingdale, butler and poughkeepsie--newburgh around 630 pm edt. other locations impacted by these severe thunderstorms include hillburn, airmont, upper saddle river, west nyack, viola, new hempstead, valley cottage, spring valley, wanaque and hillcrest. 7/1/2015 4:34 AM EDT At 434 am edt, doppler radar indicated a line of severe thunderstorms capable of producing damaging winds in excess of 60 mph. these storms were located along a line extending from near oradell to bergenfield to upper west side, and moving northeast at 40 mph. 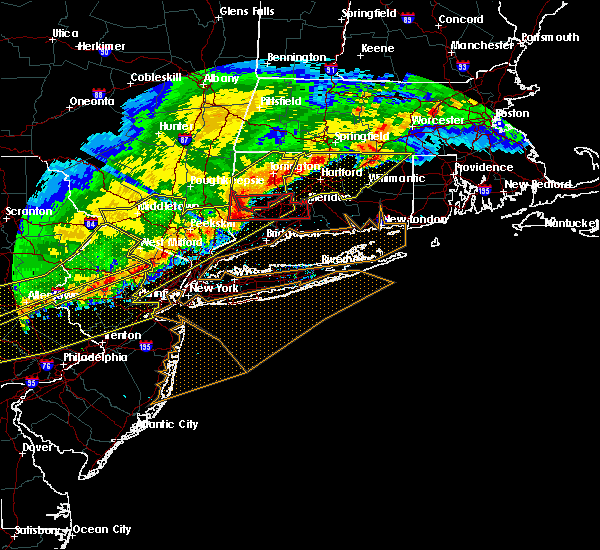 * severe thunderstorms will be near, tappan, norwood, pearl river and riverdale around 440 am edt. yonkers, dobbs ferry, east tremont, bronxville and orangeburg around 445 am edt. tarrytown, nyack, north tarrytown, throgs neck bridge, scarsdale, upper nyack, co-op city and cardinal spellman hs around 450 am edt. 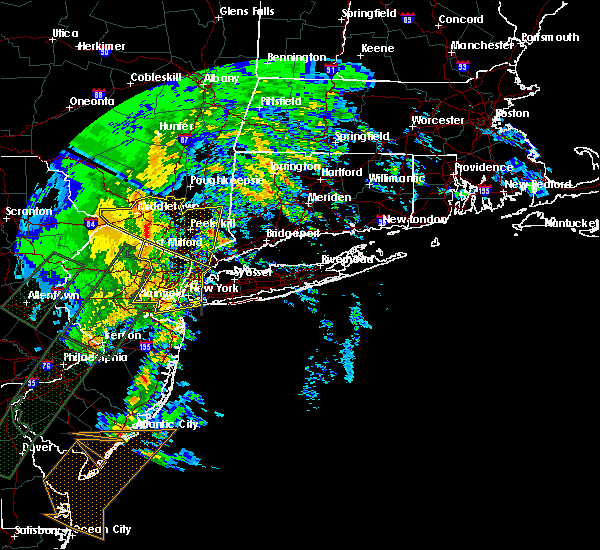 new rochelle, white plains, ossining and city island around 455 am edt. port chester, harrison, sands point and hawthorne around 500 am edt. 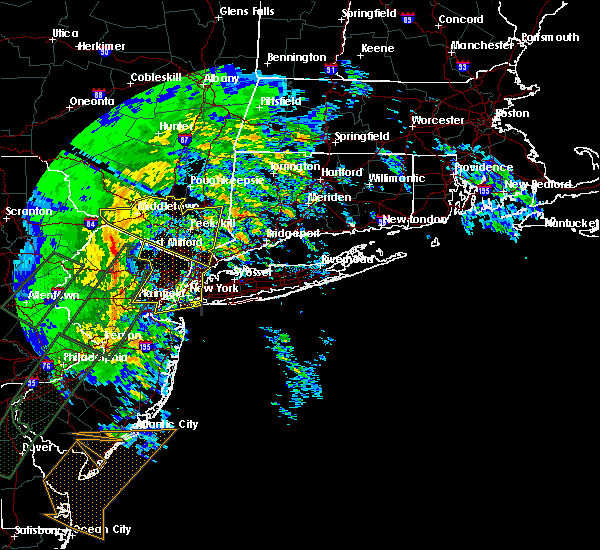 glen cove and rye around 505 am edt. mount kisco, greenwich and bayville around 510 am edt. stamford, new canaan, darien and bedford around 515 am edt. 5/27/2015 6:37 PM EDT At 637 pm edt, doppler radar indicated a line of severe thunderstorms capable of producing quarter size hail and damaging winds in excess of 60 mph. 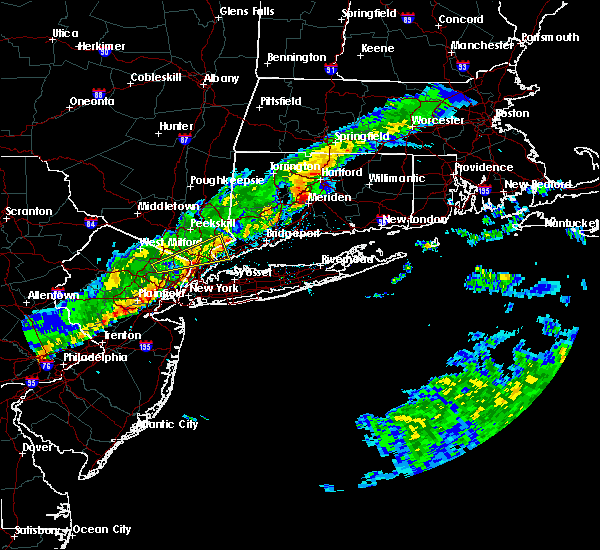 these storms were located along a line extending from pearl river to hackensack, and moving northeast at 45 mph.